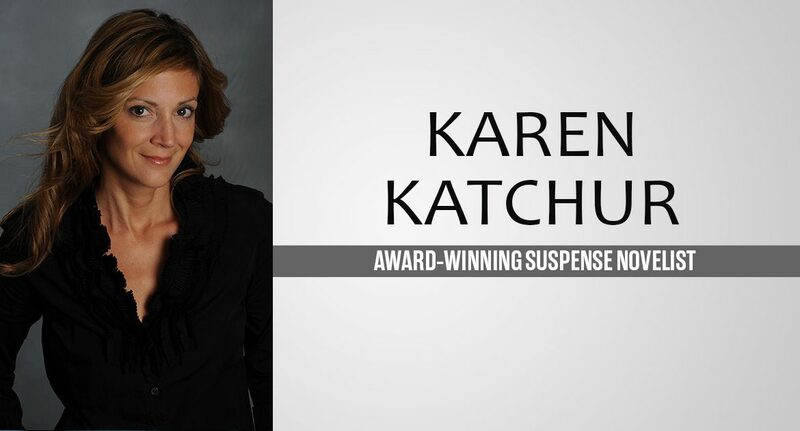 Karen Katchur is an award-winning suspense novelist with a bachelor of science in criminal justice and a master’s in education. She lives in eastern Pennsylvania with her husband and two children. River Bodies is her third novel. After discovering that her boyfriend is cheating on her, Becca Kingsley returns to where she grew up in Portland, Pennsylvania to care for her dying father. While there, a body turns up holding eerie similarities to a 20 year old cold case. As the daughter of the former police chief, Becca is quickly drawn into the case. Coming home has brought something ominous to the surface—memories long buried, secrets best kept hidden. She starts questioning all her past relationships, including one with a man who’s watched over her for years. But is he predator, or protector? What a lot of readers probably don’t know is that I have a quirky (and sometimes wickedly dark) sense of humor. I love to joke around and tend to not take too many things seriously. I don’t think this comes through on my social media pages, and it hasn’t come through in my novels, yet. My novels tend to be sober. I guess all that serious stuff has to come out somewhere. I’d love to incorporate some of that dark humor in my novels, but I haven’t figured out how. Even as I write this I’m thinking, man, I even sound serious when I’m admitting to being funny! I don’t know why that happens! If there’s a comedic writing coach out there, call me! How has being published changed things for you? Do you still write the same, or is there more/less pressure now? I never thought about becoming a writer until I was in my mid-thirties. I thought everybody told stories in their heads! I was watching Oprah’s book club one day and the audience became engaged in a heated argument over the main character’s choices. I remember thinking, I want to do that! I want to make readers talk about a character that invokes that kind of reaction. Some of the readers were so angry at the character and others empathized with her. I could see both sides. And from there I decided to write my first novel, which didn’t sell. But eventually, one of my novels did sell and here I am. BTW…the book was While I Was Gone by Sue Miller. As for whether or not I write the same, I think I do but I’m always trying to write faster. Deadlines add pressure, but no matter how hard I try, my process always ends up being slow and messy. You have a BS in Criminal Justice – What made you switch to using your degree for writing novels? I’ve been around law enforcement my entire life. My father is a retired state trooper. I’ve always had a natural curiosity with true crime—the who, what, where and most importantly for me, the WHY. I had plans to go to law school after graduating college, but I learned that I didn’t like to argue and I’m not good at it. (My husband might disagree with me here!). I tried several different careers since then but nothing stuck. The one that seemed to fit best was writing. Also, I’ve seen three dead bodies outside of a funeral home. The first two were tragedies. The third was a murder victim. I guess writing about tragedy and crime is just my way of trying to make sense of the world. My favorite book is always the one I’m working on at the time. And sometimes my favorite book is the one I haven’t written, yet! I can’t decide! Maybe a phone book, so then I could make up stories in my head about all the different people listed. I’d have enough time! Let’s talk about River Bodies. Where did the idea came from and what inspired you to write it? Every idea I get starts with the setting. In this particular book, it started with the small town of Portland located along the Delaware River. When I was young, I remembered hearing about a man’s body that was pulled from the river and how he was gutted like you would field dress a deer. I think it’s easy to see why this stayed with me. Years later my mother-in-law’s neighbors were found dead in their home with similar injuries. The crimes weren’t related, but it got me thinking about why this type of crime occurred, why this type of injury? Both small towns are big hunting communities. So I started wondering whether crimes are unique to the area where they occur. I built my antagonist around this question of whether a person’s environment impacts who that person becomes, ie nature vs nurture. I love writing what I call “fight scenes” where the characters fight, claw, shoot, stab…or whatever fresh hell I come up with to get them brawling. I also really, really loved the backstory scene between Becca (protagonist) and her father when she was just eight years old. It’s a scene that reflects the complicated feelings she has for him that follow her through adulthood. What do you think readers will love about River Bodies? I hope they love the characters and how real they are given their faults and flaws. Okay, maybe they won’t love the antagonist because he does some pretty awful things. But I hope they understand why he does what he does. In so many ways he’s a product of his environment. I always have an ending in mind, but then once I start writing it evolves into something else. What is the publication date and where can readers buy River Bodies? Readers will be able to find the book on Amazon on November 1, 2018. I just turned in Cold Bones, Book 2 in the Northampton County Series. Detective Parker Reed is back with a partner, Detective Geena Brassard, and together they investigate another big crime in a small town. This time it’s a missing person cold case, where thirty-year-old bones are found on the mountain. Three childhood friends must come together to confront their past, expose their secrets, and learn how far they would go to protect the ones they love. Thank you for bringing this book to life and happy to learn a bit more about its story and its author! Would love to read and review…..